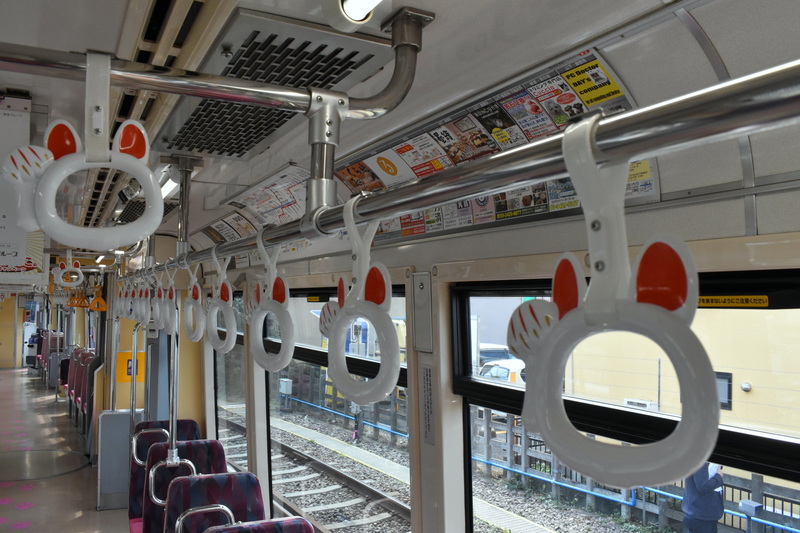 Tokyu Corp. on Monday unveiled a new tram painted with manekineko (beckoning cat) livery to commemorate the 110th anniversary of the Tamagawa Line and promote use of the Setagaya Line to tourists. Upon its completion in March 1907, the Tamagawa Line connected Dogenzakaue and Sangenjaya stations. That line closed in 1969, but it now operates as the Setagaya Line, linking Sangenjaya and Shimotakaido stations in Setagaya Ward. 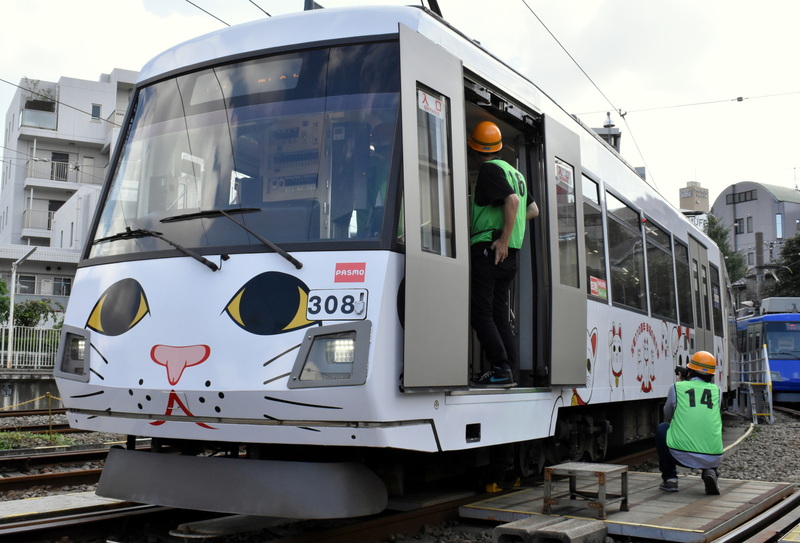 “When considering the best way to commemorate the anniversary and further boost the popularity of the railway, we came up with an idea of collaborating with Gotokuji Temple because the temple is known worldwide for (enshrining) a beckoning cat. 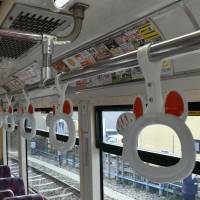 That’s why we produced a tram featuring designs of beckoning cats,” Yoshinari Hirae, manager of Tokyu’s railroad planning division, said at a media preview in the train’s storage facility in Kamimachi Station. Manekineko are typically depicted as figurines with one paw raised. Placing the talismans in restaurants or shop windows is believed to bring good luck and prosperity to proprietors or businessmen by luring customers to patronize them. Situated near Miyanosaka Station, Gotokuji Temple, established in 1480, is one of the most popular tourist destinations along the Setagaya Line and is widely considered to be where the tradition of beckoning cats originated. 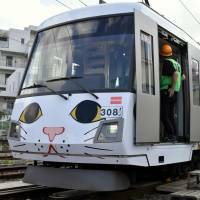 According to Hirae, the cats painted on the train were originally designed by the temple. The Setagaya Line, which runs across Setagaya Ward, is one of the few streetcar lines still operating in Tokyo. 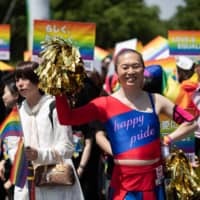 According to the transport ministry, this and the Toden Arakawa Line that runs through Arakawa and Shinjuku wards are the only tram lines in the capital. “More than the usual trains, trams are connected deeply with local regions. 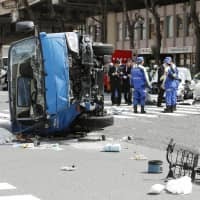 Setagaya Ward is a quiet residential area, but it has many historic sites such as Gotokuji Temple, Shoin Shrine and Setagaya Hachimangu Shrine, that are highly recommended to tourists,” Hirae said. The company plans to keep the newly decorated two-car tram in service until the end of March.